Taking Control of Your Diabetes is a unique book that will inform, empower, and enlighten you to live happier and healthier with diabetes. 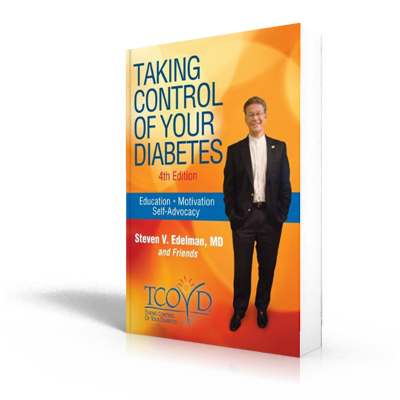 The author, Steven V. Edelman, MD, is not only a physician who cares for people with diabetes, but has lived with this condition for over 40 years. Through humor, real case presentations, expertise from other diabetes specialists, and a down-to-earth writing style, Taking Control of Your Diabetes will not only educate you but, more importantly, it will inspire and activate you to put diabetes high on your priority list. Taking Control of Your Diabetes is the most extensive and comprehensive book for people with diabetes, and their loved ones, as well as interested healthcare professionals. how to avoid and treat hypos, heart attacks and strokes, kidney disease and sleep apnea. the latest on new medications, insulin pumps, meters and CGMs.